I am a 45-year-old man who does not like exercise, but I do it anyway. It’s supposed to make you feel better, but many times it just makes me sore and tired. Sometimes I tell people, “This healthy lifestyle is killing me!” The only way I endure it is do something I enjoy while walking on a treadmill. This helps me to forget that I am sweating and walking in place like a hamster on a wheel. Usually that means watching video podcasts of my favorite preachers: Erwin Rafael McManus, Tim Lucas and Greg Boyd. 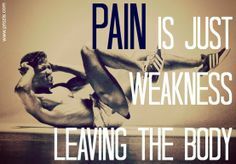 I once read a sign in a gym that said, “Pain is just weakness leaving the body.” I love that. It inspires me when I feel really sore from working out. It gives my pain meaning. It makes me think of the pain we feel when embracing other people’s brokenness. Some can’t handle it and turn away. Some dive into that pain and grow in compassion and love (spiritual strength.) Maybe embracing other’s pain is the feeling of apathy or indifference (spiritual weakness) leaving our bodies. I have a special needs child. She is the greatest…and sometimes her behavior drives me crazy. Her emotions are up and down like a roller coaster. When things are good, she is delightful, sweet and silly. When she is on tilt, she isn’t fun to be around because she is frustrated at herself or the world around her. Sometimes this anger gets unleashed towards me. My natural inclination is to push away from pain. My other inclination is to press in close because of love. My full time job at New York City Relief is helping people challenged with homelessness. You would think that would be enough pain to grapple with. The streets are teeming with an ocean of brokenness in the form of men, women and children with no safe place to turn. Maybe embracing other’s pain is the feeling of apathy or indifference (spiritual weakness) leaving our bodies. Jesus is drawing me to himself by giving me the opportunity to lay down my life. Loving people through their difficult behavior is testing the depth of my love and the substance of my faith. If I want to “belong to the truth and set my heart at rest in his presence”, I have to show a heart of compassion. God knows that it is easier for me to show compassion to someone on the street then to my own family. He gives me no wiggle room. I must dive wholeheartedly into my daughter’s heart at the expense of my time, energy, peace, comfort etc. Isn’t that exactly what Jesus did for me? In Matthew 25:31-46, Jesus asks everyone on judgement day if they took care of the broken: the hungry, the sick, the naked, the stranger and the prisoner. Maybe Jesus isn’t trying to get us to go to the broken so much for their sakes as for ours. We need to meet him face to face in order to escape the false concept of Jesus in our minds- the god we have created in our own image. You see, I am attracted to a god of power that will help me be powerful. I am perplexed by a humble God who chose to become poor, weak and broken. I am hesitant to walk in these kinds of footsteps, but it was his humility that brought my healing. Now he calls me to share my poverty in spirit, my weakness and my brokenness with others to bring them to a place of healing as well. As I decide to bear the pain of my daughter and the many others suffering around me in life, I can know that this pain is not in vain. It is actually the feeling of apathy and indifference (spiritual weakness) leaving my body. No pain, no gain.